This is a guest post by Robin Sullivan, a small press publisher, publicist, and public speaker. She blogs at Write to Publish. You can also follow her on Twitter. If you want to guest post on this blog, check out the guidelines here. I hear the following from authors all the time, “All I want to do is write. I hate promoting myself. I’m no good at it.” The result is they don’t work on their platform, hoping somehow that the whole notion will somehow just go away. 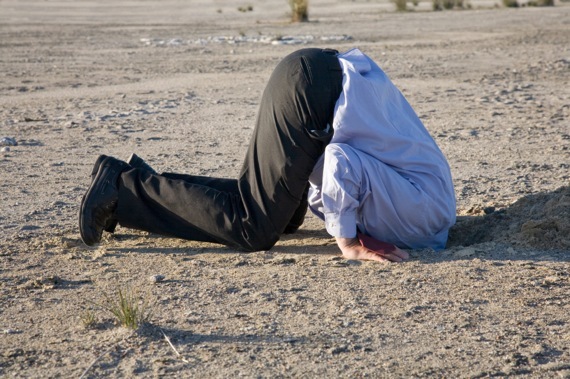 Putting your head in the sand is not the answer. It’s no longer a question of if an author needs a program, it’s now part of the writing business and can mean the difference between success and failure. But fear not, I’m here to tell you that it’s not only easier than you think, but you should know that someone with your attitude is actually well-equipped to do well. I’m going to let you in on the most important, and most often overlooked aspect of social networking: It’s not about selling. It’s about participation. It’s about being a member of a community. It’s about connecting with people who share your interests. Those that use social networking merely as a venue for saying, “Buy my book, buy my book,” are missing out. Nobody likes to be sold to. What people gravitate to is those who give of themselves. Here’s what you need to know about getting started in social media. Observe. Start out by joining and watching. Pick a venue to get yourself started. It could be twitter, an online forum, or a site dedicated to books like GoodReads, Shelfari, or LibraryThing. You don’t have to do anything at this point other than watch and learn. Be a sponge and absorb what is going on around you. Get a feel for the place. Wait until you are comfortable. Participate. When someone makes a comment that you agree with, support their position. Expand on it. Give an example from your own life that illustrates the point. If you disagree, do so respectfully, offer supporting information for your opinion. Contribute. Once you are comfortable talking with others, it’s time to go to the next level. Start contributing. If you read an article that people in your group might find helpful, post a link to it. If you read a book by someone in the group and liked it, tell others. Be supportive. Be helpful. Provide Information. Let the people in your group know about what’s going on in your life. Do you have a signing coming up? Is a new book being released? Have you posted a sample chapter for free? Did a magazine publish one of your short stories? This isn’t selling; it is informing. You aren’t telling them to buy; you are letting them know what you have and leaving the decision to them. Notice that I never once asked you to sell. That’s what’s so great about social media, you don’t have to. Become a person that others like, be one that is helpful, let others know that you have products (books) and the sales will come. Now I know what you’re likely to say next, “But Robin, that’s a LOT of work. I don’t have time for all this. I want to write.” I understand, but is writing ALL you do? Of course not. What if you cut out some TV? Is having your dream of being a writer worth your spouse helping a bit more? Can they do the grocery shopping or get the kids bathed and ready for bed? By trading off on non-writing tasks you can make time to devote to this. The only thing that will hold you back is your belief that it will be a chore. If approached differently, this would be so, but if you follow my steps you’ll find you actually look forward to your time online. When you receive a great review, tell your network, and they’ll celebrate with you. If you are struggling with a chapter, talk about it and you’ll get words of encouragement. You may just find the opposite is true, that spending time online can be very addictive. Does that sound like such so terrible? Question: What do you need to do next to take your platform to the next level? You can leave a comment by clicking here.